Craft Vapery Review - The Ultimate E-Juice Subscription? Great prices – 8 bottles (at least 120 ml) of e-liquid for $61.99. A fantastic selection of juice brands on offer, including many big names. Well-presented boxes, with little extras thrown in too. An intuitive, simple and detailed flavor preferences quiz. Excellent flavor selection: the boxes are hand-curated, and it shows. Five nicotine levels: 0, 3, 6, 12 and 18 mg/ml. An option for high-VG juices. Hardware can be added to your box too. Domestic shipping is $5 – some other services throw it for free. Some other services are cheaper. Craft Vapery is one of the best e-juice subscription services on the market, offering a hand-curated selection of some of the best e-liquids on the market delivered right to your door. There are cheaper services, but if you want one of the best, it’s worth paying a bit more. In a way, deciding on an e-juice subscription service is even harder than directly choosing some e-liquid. Whereas you can make decision based on the flavors offered when you’re buying juice direct, for a subscription service, the “product” is really how good the curators are at choosing e-juice that suits your tastes, and for that reading reviews is more crucial than ever. The benefit is that if you choose an awesome e-juice subscription service, you’ll have a constant supply of new and interesting juices delivered to your door each month, but finding one that can actually accomplish that is another matter. Craft Vapery is a California-based e-juice subscription company that aims to do just that, boasting the most personalized vaping experience in the industry, as well as still offering cost savings in comparison to buying the juices direct. But anyone can claim to offer the best e-juice subscription service. The question is: does Craft Vapery have a good enough service to justify the hype? We’ve put the service to the test in our Craft Vapery review to find out. Craft Vapery works in the same basic way as all subscription services: you tell them what you like and choose how much juice you want each month, and then start receiving your boxes. You have the option six different subscription levels: two 15 ml bottles for $19.99, three for $28.99, four for $36.99, five for $43.99, six for $49.99 and $61.99 for eight, with the number of bottles being a minimum amount. You can also add extras onto your subscription, including an eGo One starter kit (a one-off addition) or a regular supply of coils and/or Native Cotton wick. You can also pay up-front for several months to receive a discount. Your flavor preferences are established through two questions addressing the flavors you love and the flavors you want to avoid, with a big selection of flavors to choose from – for example, it isn’t just “fruits,” it’s “tree fruits,” “tropical fruits,” “berries” and “citrus.” You either put a “yum” or a “yuck” next to each of these flavors (with likes and dislikes being covered on separate pages), and you have the option to write additional notes in for the curator to offer more detail on the flavors you like. For example, one of the options is “floral and spices,” which didn’t work for me because I like spices but not floral flavors, so I clarified my preferences rather than having to either choose “yum” or “yuck” for the whole category. You also get a choice of five nicotine levels – 0, 3, 6, 12 and 18 mg/ml – and the option to say you prefer high-VG juices. When you sign up, the payment is taken – along with $4.99 for domestic shipping – and your box is shipped out within one working day, and they do offer international shipping wherever it’s allowed by law. The payment (and delivery) stays around the same time each month, and you can cancel at any time. Craft Vapery has an impressive selection of e-juices, from brands such as Beard Vape Co, CRFT, Cuttwood, Halcyon Vapors, Kilo, Lost Art, Ripe Vapes, Tasty Cloud, Velvet Cloud, P.O.E.T and many others. Each Craft Vapery package comes in a blue, branded box, with a foam insert lining the box to protect your juices in transit. The foam packaging has a removable rectangular top piece, with a sample of cotton wick, some little cards with information about each e-juice, a Craft Vapery branded juice cloth (like a handkerchief for e-liquid) and a few stickers greeting you as you open the box. Your juices sit underneath the foam lid, and you also get a couple of needle-topped plastic bottles in there too. Everything about the experience contributes to a kind of giddy excitement like you’re opening a Christmas present. They even give you a small bag of Skittles with your box. Little things like that really help to make the experience enjoyable. Overall, they did a fantastic job on the presentation front, and it makes you feel like you’re getting great value for money. The Flavors – How Was the Curation? The most important thing, however, is whether or not Craft Vapery’s flavor selection process is as good as they claim. I went through the process, telling them what I like (baked goods, creams, custards and vanillas, spices, coffee, nuts, chocolates, candy, exotic fruits, tree fruits and berries) and what I don’t (teas, floral, tobaccos and cigarettes), and received an 8-bottle box in my first month. So, did the curation live up to my expectations? Here’s a run-down of what I got in my first box. Metatron by Sacred Enlightened E-Liquid: This is a berries, sweet oats and milk e-liquid that came in a fancy triangular box. The flavor is right in line with my preferences, and the taste definitely lives up to the description: it’s a light, sweet, creamy e-liquid with hints of oats and blueberry overtones. A good pick for my tastes, although it isn’t a favorite purely because I can never get too excited about blueberry juices (but they didn’t know that). Indian Giver by Traditional Juice Co.: This is a deep fried ice cream e-liquid, topped off with powdered sugar. In real life, I’d feel like deep-frying ice cream was excessive, to say the least, but as an e-juice, even writing that makes my mouth water. It’s as amazing as it sounds: devilishly sweet, but still gentle enough in flavor to make it an all-day vape for me. A fantastic pick from Craft Vapery – I had to hold myself back from draining the whole bottle before writing the review. Gravy Train by Clancy’s: This is a mix of cream, vanilla, hazelnut and caramel, with the description again ticking a lot of boxes for me. The juice is another great choice: it has the richness of the cream and the sweetness of the caramel underpinning the whole thing, topped off with delicious and well-captured hazelnut and vanilla. This is definitely another one that hits the spot for me. Monkey Snack by Ripe Vapes: This is a peanut butter and banana e-liquid, boasting a rich, creamy flavor and again hitting on my flavor preferences very well. The juice accomplishes what it sets out to, with the two components being equally balanced in the mix and enveloped in a delicious, creamy backing. Another great choice for my tastes from Craft Vapery. King Kong by Majestic E-Juice: This is a banana crème brulee e-liquid, again being a pretty good match for my tastes. The flavor is executed beautifully, rich with cream throughout and with a nice touch of authentic-tasting banana on the inhale. This is an all-day vape for me, with two delicious flavors that have been balanced perfectly, and another brilliant pick from Craft. Knight by King’s Culture: This is a strawberry and banana, “Starburst” flavored e-liquid, with a candy twist on a fruity juice. The execution here leaves a little to be desired for me, though, with a definite hint of the authentic fruits but the whole thing being overlaid with a kind of perfumey, chemical taste – assumedly meant to be the candy – that really ruins it for me. Not a bad pick, necessarily, but definitely my least favorite in the box. Sweet Mango by True Flavors: A self-explanatory flavor, and the mango is pretty well-replicated, with the sweetness backing the flavor up throughout. Although it’s pleasant, it doesn’t really make for the most exciting flavor in the world, but it fits right in with my stated preferences – tropical fruit and sweet stuff – so it’s another solid choice. The Shrine by the Originals: This is a cinnamon e-liquid with a buttery glaze, described as a “cinnabon in vape form.” Although there’s a lot of competition for this title, this could well be my favorite juice from the box, with a well-captured cinnamon softened by just the right amount of sweetness. I particularly appreciate this choice because one the optional notes I left was that I love cinnamon bun juices, and Craft Vapery delivered. Extras: As well as the juices, my box included a small sample of Native Wicks’ premium vaping cotton, two plastic bottles with needle tops and a nice Craft Vapery cloth. The cotton is brilliant – with a clean taste and great wicking – the bottles are obviously useful, and the cloth, despite sounding like the worst extra, is so handy it makes me wonder why I’d never gotten anything like this before. With only one juice I wasn’t too impressed with out of eight, Craft Vapery did a fantastic job with the curation. Even the disappointing flavor was a good choice based on my preferences, and all of the others were both in-line with my preferences and executed well. The fact that they included the cinnamon roll juice is a testament to the fact that they really do offer a personalized experience, and they do pay attention to the extra little notes you leave alongside your preferences. Overall both in presentation and juice selection, Craft Vapery does an excellent job, and easily ranks as one of my favorite services from all of those covered in the Battle of the Boxes post. 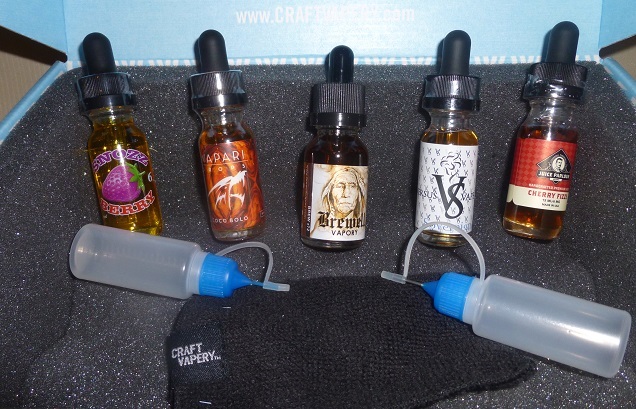 As a bonus, Craft Vapery signed me up for a few additional months of five-bottle boxes so I could get a feel for the service over time for this review, and I’ll be updating it in the coming months with a brief overview of the subsequent boxes. The second box included Unicorn Milk by Cuttwood, Dirty Strawberry by Broken Bottle, Number 88 by Beard Vape Co., Sunset Orange by TSL Flavors and Revenge of the Geeks by Teardrip. To avoid excessive detail: Unicorn Milk is awesome, Dirty Strawberry is a uniquely delicious peanut butter and jelly juice, Number 88 is an impressively authentic chocolate and mint blend, Revenge of the Geeks is a Nerds-flavored candy juice and Sunset Orange is a citrusy option. All of the juices in the second month’s box were excellent, and although I’d put Number 88 as my favorite, Craft Vapery maintained the quality in their selections much like the first month. For the final two months, the Craft Vapery subscription maintained the same level of quality when it came to presentation and personalization, and the juices remained fairly solid. Month three’s box came with the Dough by DNA, Sutro by Frisco Vapor, Swag by Nick’s Blissful Brews, Aphrodite by Mythic Haze and the Carter by Cloud Stout. All of these juices are pretty well matched for my preferences, but the stand-out choice was the Carter – a coffee, chocolate and toffee blend that’s heavy on the sweet but unflinchingly delicious. The Dough, despite being a great match on paper – a cookie dough juice – was woefully executed, with a synthetic taste overriding the whole thing and monumentally ruining the execution. This was probably the worst month from my experience with Craft, but most of the juices were still enjoyable. For month four, the selections went back to the level of quality I’ve come to expect from Craft. The selection included Coco Bolo by Wapari Drops, Cherry Fizzle by Juice Parlour, #72 by Brewell Vapory, Sovereign by Versus Vape and Snozzberry by Snozzberry. Coco Bolo is a sugar cookie milkshake, and is every bit as awesome as that sounds, easily the best of the box and a fantastic choice. I enjoyed all of these, but the other one most worthy of mention is #72 by Brewell – a unique orange coffee blend that’s hard to put down. And the Snozzberries taste like Snozzberries. So despite some disappointments in month three, the selections from Craft Vapery continued to offer plenty of interesting flavors, pushing the boundaries of what I’d usually buy and with both boxes including some absolute gems. Craft Vapery is a top-quality subscription service, with excellent juice choices overall, beautiful presentation and a generally positive experience all-round. The price is about mid-range – at least in comparison to the other included in the Battle of the Boxes post – and for the quality of the juices you get, it’s definitely worth the money. There’s very little to complain about with Craft Vapery, and since complaining is a key part of a reviewer’s job, that’s pretty high praise – it may not have been perfect, but the one juice I didn’t enjoy definitely sounded good on paper, so it’s hard to be too disappointed. At the time of writing this, I have two boxes still to come, and I’m genuinely looking forward to them. Thanks for taking the time to review Craft! I wanted to let you know that we at Craft just recently lowered our prices, you can now get started for $14.99! Here is a full list of our price changes: 2-bottles $14.99, 3-bottles $21.99, 4-bottles $28.99, 5-bottles $35.99, 6-bottles $41.99, 8-bottles $54.99.